Tree Stump Removal Estimator | StumpMaster Tree & Landscape Ltd. Please use our online estimator for services. Depending on the complexity of the job, a site visit may be required. Please refer to the following guide to assist in requesting your free, no obligation estimate from StumpMaster. Provide as much information possible for a more accurate quote. What is the width/diameter of the stump? 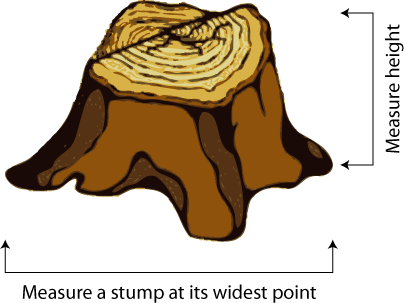 *Note: If the stump's root system has created a hump of the ground around it, extend the width/diameter of the stump to include grinding the hump to grade level (*refer to stump diagram below). Note how many surface roots there are and how far they extend from the stump (*might be subject to an extra charge). If known, indicate what kind of tree it was in order to determine more accurate grinding time of certain wood. Please indicate if there are any gates to enter through or if there are other obstacles to maneuver around (e.g. stairs) or if the landscape is sloped. Gates must be a least 36 inches wide to allow for enough width clearance of our machinery. How deep would you like the stump/roots ground below grade level? Knowing what your landscape plans are after the stump grinding has taken place will help you in your depth choice (e.g. lawn, garden bed etc.). Please let us know of any underground utilities or sprinkler systems that you are aware of in the area. For a free on-line estimate, please fill out the following information below. For the most accurate estimate, a detailed job description is preferred.